I left early this morning to meet friends to head to Skagit County to do some birding. The agricultural area west of the interstate is an important wintering area for waterfowl and raptors. Even though it was raining, we hoped to find some good birds. We were not disappointed. At our first stop along Fir Island Road, we had 4 Short-eared Owls and 3 Northern Harriers patrolling the fields looking for an unwary vole. We saw one harrier drop down into the grass and come back up with something in its talons. Instantly, an immature Bald Eagle swooped out of a nearby tree to attempt to steal the catch. The harrier dropped its catch but was able to retrieve it after the eagle gave up. Near Edison we saw more than 20 Bald Eagles roosting in a small grove of trees along the Edison slough. Around the same area, we found several Rough-legged Hawks. These large raptors are down from the arctic and subarctic regions of North America to winter in this area. We saw both light and darker individuals. The streaking on their heads and neck, long wings and distinctive tail were fun to study. Several individuals sat patiently while we stopped and looked them carefully. We also spotted a Peregrine Falcon near the top of a tree and were able to study it carefully through a spotting scope. 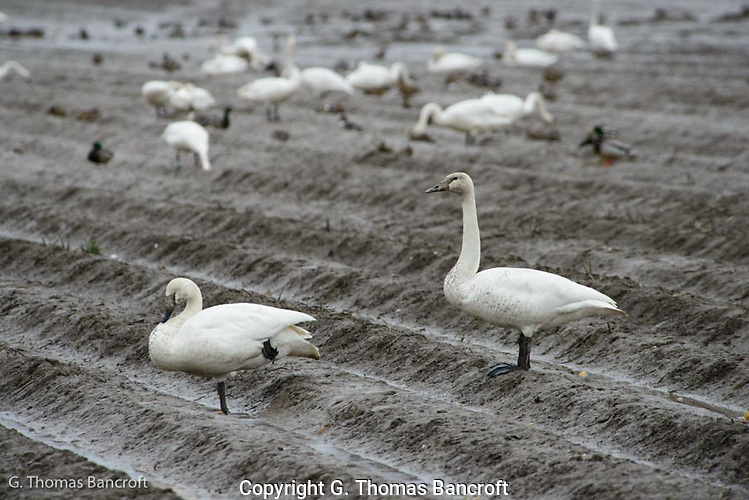 Especially fun for me was the chance to see Tundra Swans and Trumpeter Swans side by side. 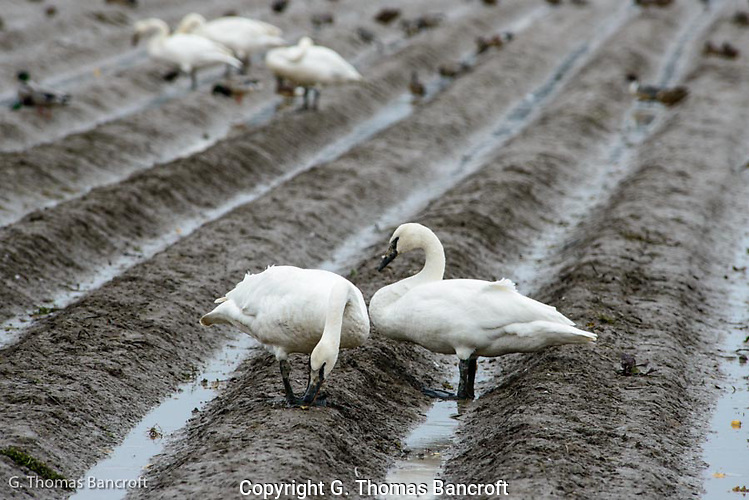 Tundra Swans, the more common species, were feeding in many fields and flying across our view often. Trumpeter Swans are really big and are the largest living flying bird currently. I had not realized this until we had the two species standing side by side. 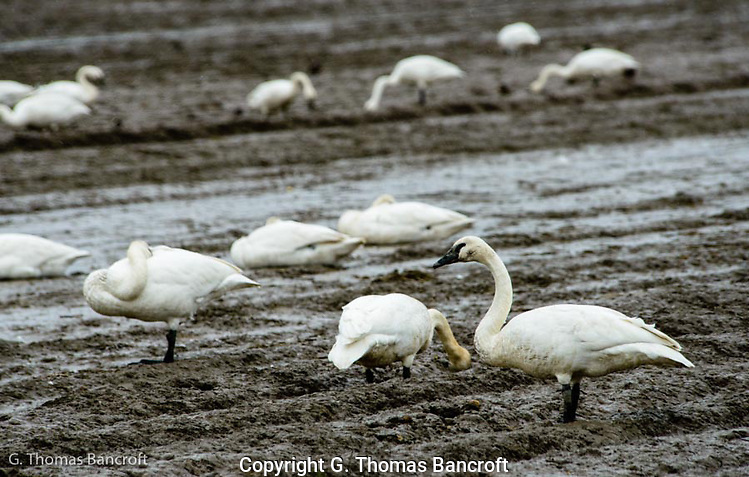 The Trumpeter Swan looked like they had elephant legs compared to the Tundra Swans. Generally, you look at the bill and head to tell these species apart but often that is hard when they are far away. 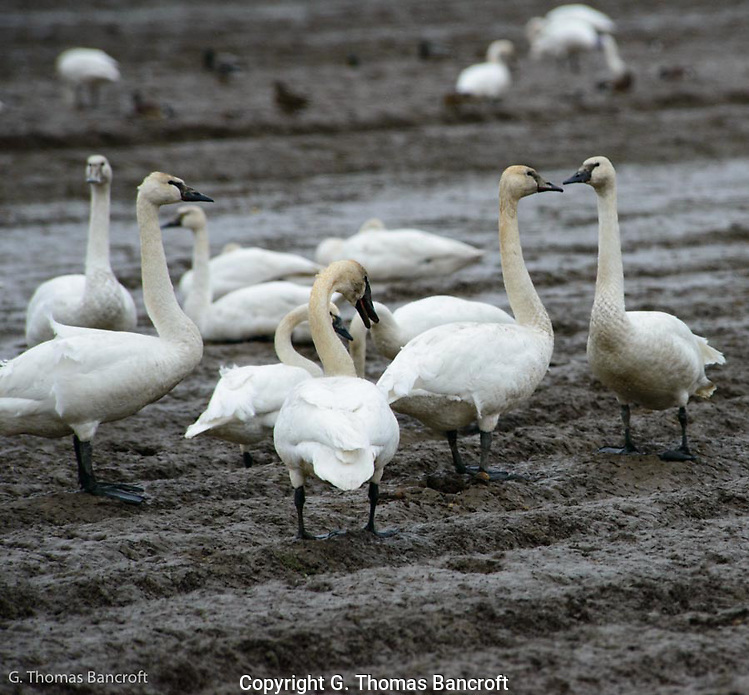 Having them side-by-side was a real treat; Trumpeter Swans are several pounds heavier than Tundra Swans and have a wing span approaching 7 feet. Early in the morning we had lots of Snow Geese flying over in large flocks. Late it the day we spotted a cloud of Snow Geese above one field a long ways away. I estimated that there were more than 3,000 birds flying. As I scanned the birds in flight, I suddenly realized that there were at least 4 times as many birds on the ground in the fields near the flying birds; an extremely impressive group. We closed the day just south of SR 532 where we saw a wintering Snowy Owl. This species breeds in the Arctic tundra and usually stays north of us in Washington. When food supplies farther north are too low, we have a winter invasion. A chance to see one, even at a distance, was really a fun way to close a great day. Winter must be a hard time for birds, especially ground feeding birds, when the snows are heavy and deep. In February 2010, we had about two feet of snow all at once in the Washington, DC area. 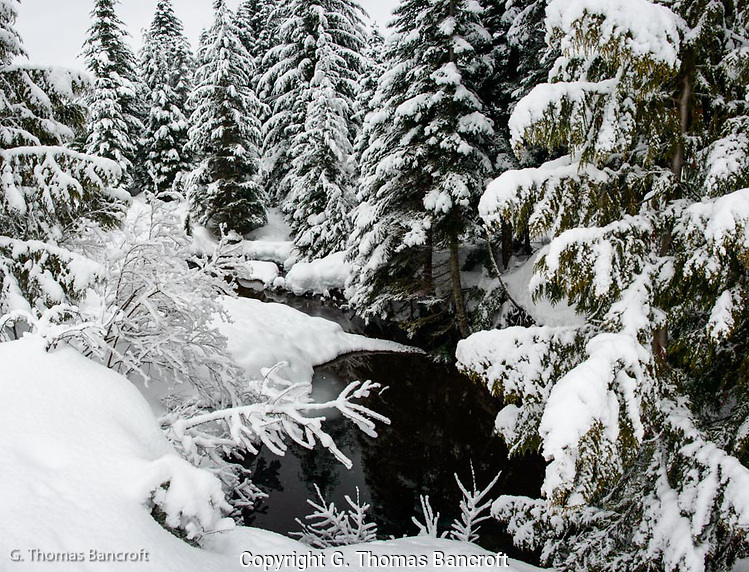 It blanketed the neighborhood where I lived with a white coat of paint and buried the gardens in a thick white quilt. Because our neighborhood had extensive gardens with many azaleas and other bushes it was an excellent wintering place for White-throated Sparrows and Dark-eyed Juncos. Small flocks worked through the leaf litter looking for seeds and other food items. These birds fly south to our area in central Maryland from more northern nesting areas. 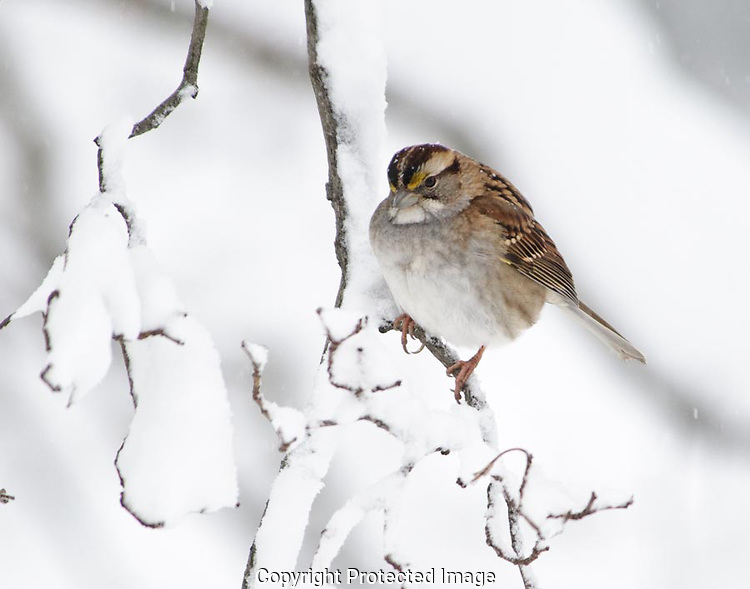 Other birds, like Cardinals, Song Sparrows, and Morning Doves, were probably local birds that stay through the winter. Now with deep snow across the landscape, they needed to find food above the snow because it was too deep for them to scratch through. Fortunately, for them, many people including me feed birds in winter and I had many hanging around my house in the bushes searching for what they could find and searching around the feeder. Many stayed in the yard after feeding because the thick bushes gave them protection from the snow, which was still falling and the wind. I bundled up and went out to see what they were doing. I started out the back door when I noticed some white-throated sparrows scratching under the big azalea by the garage. This azalea extended more than 10 feet tall and the snow wasn’t very deep under it. Plus I had thrown some seeds under it before the snow started. They had to work through a few inches of snow even under this dense bush. Each sparrow would do two or three stationary hopping scratches with both feet to move snow and leaves and then look to see if they exposed any food. There wasn’t much room so individuals kept chasing each other for prime spots. The little White-throated Sparrows had their feathers all puffed out to create a fluffy down coat around their bodies. 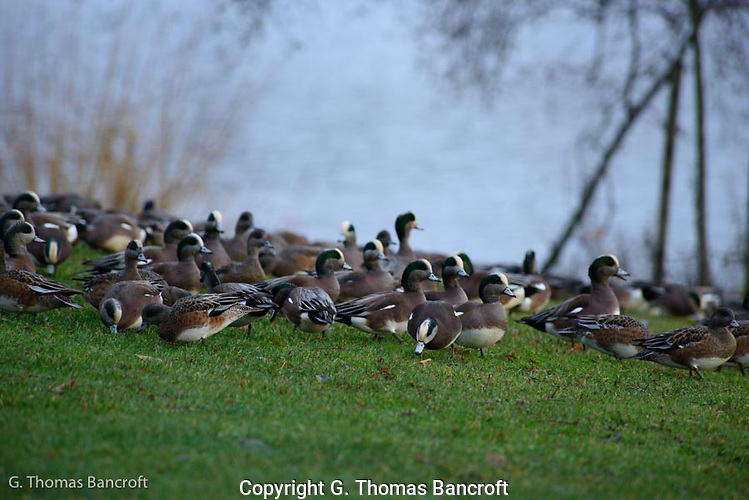 The interlocking barbules form an effective windbreak and by puffing their feathers they create a thick blanket. These birds feed primarily on the ground by scratching in the leaf litter to find seeds or grubs. I had thrown seeds under the azalea to give them extra chances. We have two color forms, one with distinctive white line on the head and the other with buffy line. They were quite active because they needed to find sufficient food to make it through the long night. 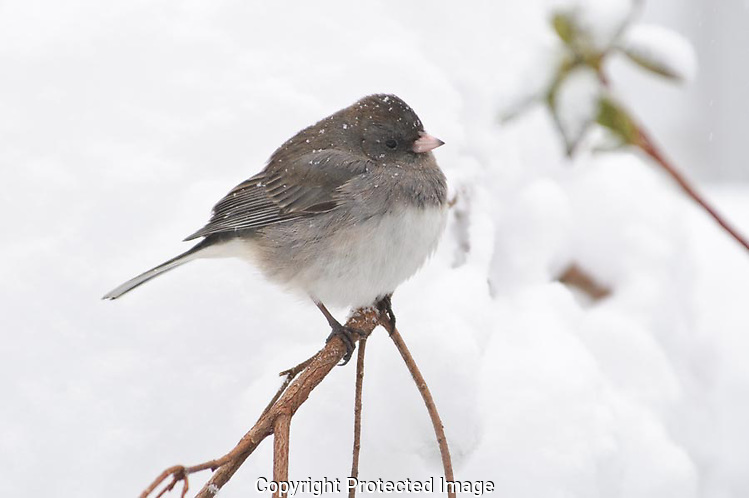 The Dark-eyed Juncos are so pretty with their black tuxedo coat, black tail with two outer white tail feathers that show so distinctively when they fly. They seem to only come into my backyard when snow is on the ground and feed more out in the open than white-throated sparrows. They seem to do fine without my help except in these difficult times. Individual snowflakes rested on their backs without melting. They didn’t seem to mind. 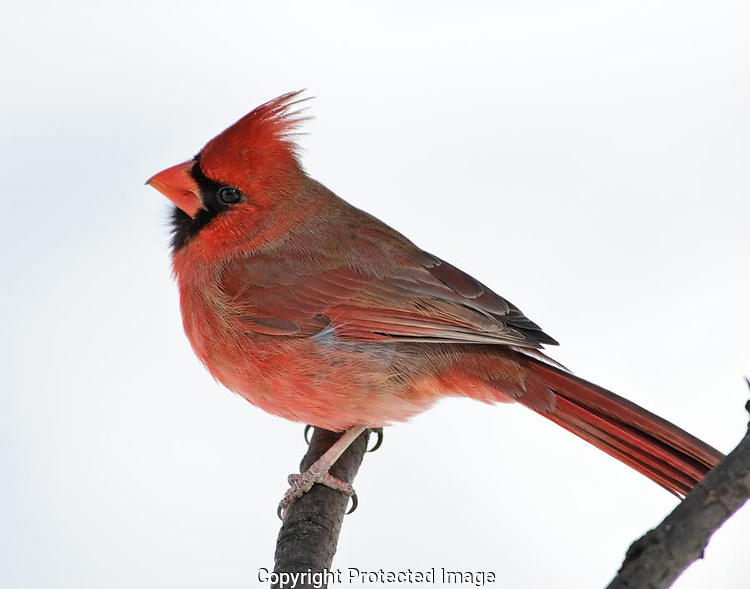 Cardinals really stand out against the snow. These are bigger than the previous species and displace them quickly at the feeder as well as the prime places under the bushes. I found at least 6 individuals hanging around the yard at one time. In winter, they become less territorial. An individual would feed for a minute or two and then fly into a bush to rest and preen its feathers. One of my favorite birds is the Blue Jay. They come into the yard in a raucous flock, letting everyone know they are here and watch out. They have a great personality and you can almost imagine what they are thinking. I captured one looking over its shoulder at me and it sure looked to me that it was cross that I was in the yard when he thought he should have first pick. The snow shut Silver Spring down for a few days while they cleared the roads. A large branch came down from one of my neighbor’s trees and just missed taking out our electricity. I had a few days off from work to enjoy the snow and seeing how the birds fared through it. After it melted, I still had good numbers coming into my yard and in the neighborhood as I walked it suggesting many made it through this tough time. 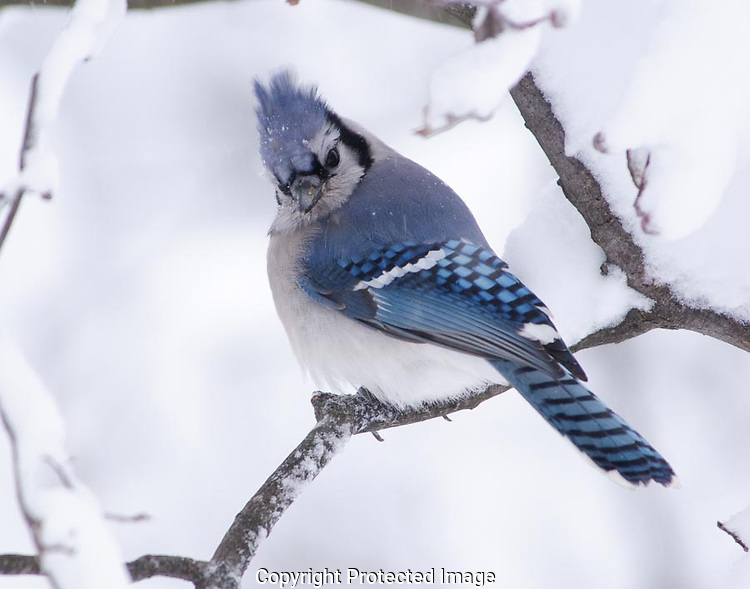 You can see additional pictures in my winter yard bird portfolio. Thanks for reading. Seattle was engulfed in rain at 7AM this morning but maybe Snoqualmie Pass would be cold enough for snow so I left to check it out. I arrived shortly after 8AM and was one of the first people to drive into the parking lot at Hyak. The pass had received 2 inches of fresh snow during the night. 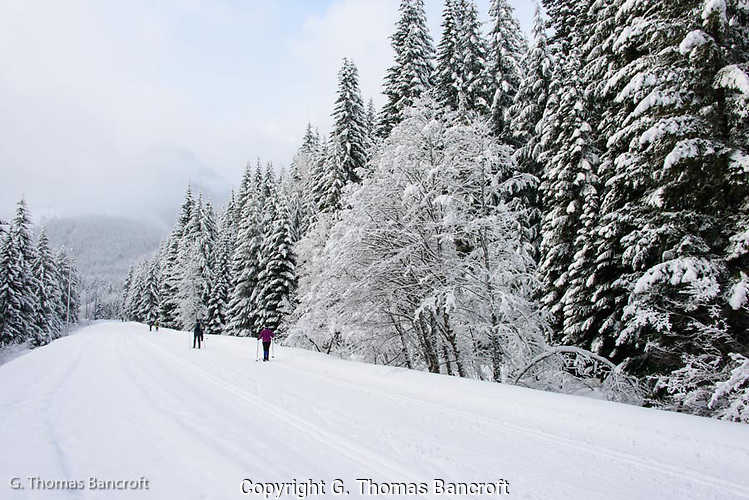 A few cross-country skiers headed down Iron Horse Trail in front of me but I was the first one on snowshoes this morning. 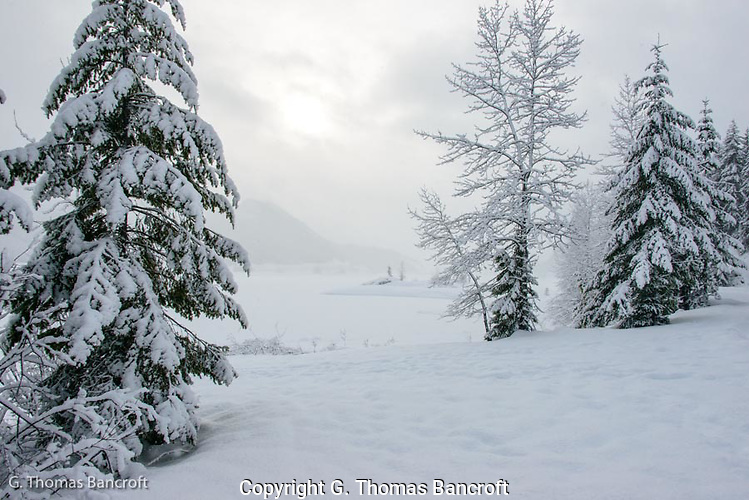 The alder and spruce trees had several inches of snow on their branches. It made for a winter wonderland. The snow started to fall soon after I started down the trail. 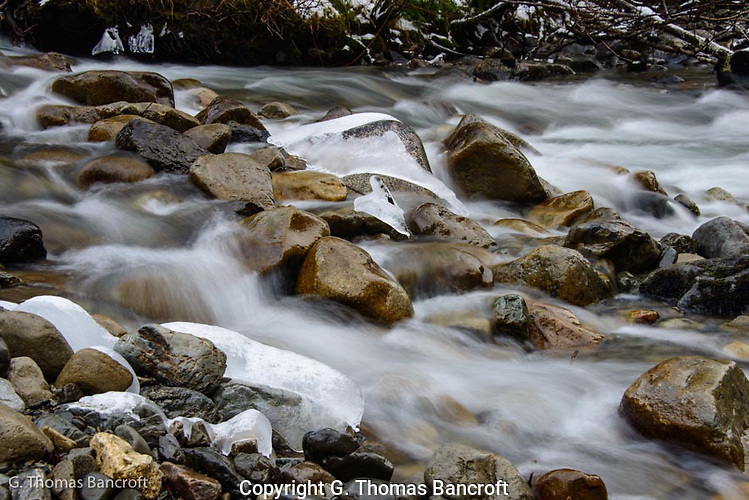 It was the small ice crystal snow and bit against my cheeks as I hiked. I dropped down from the main trail to one closer to the water and had it to myself. 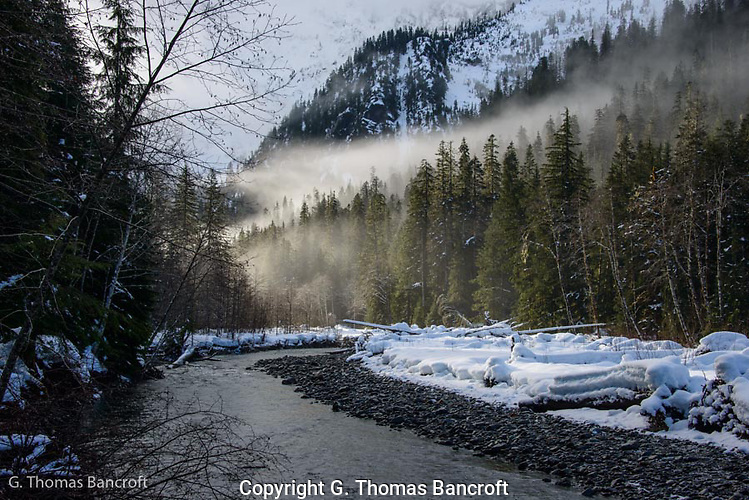 The sun glowed through the snow clouds accenting the scene. A raven passed flying west, squawking as it went. 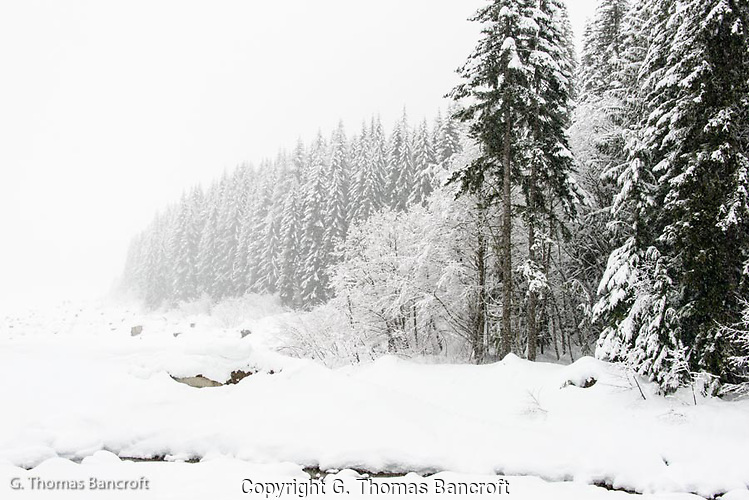 The trees gradually vanished into the falling snow as one looked down the trail. The landscape created different emotions depending on the direction you looked. 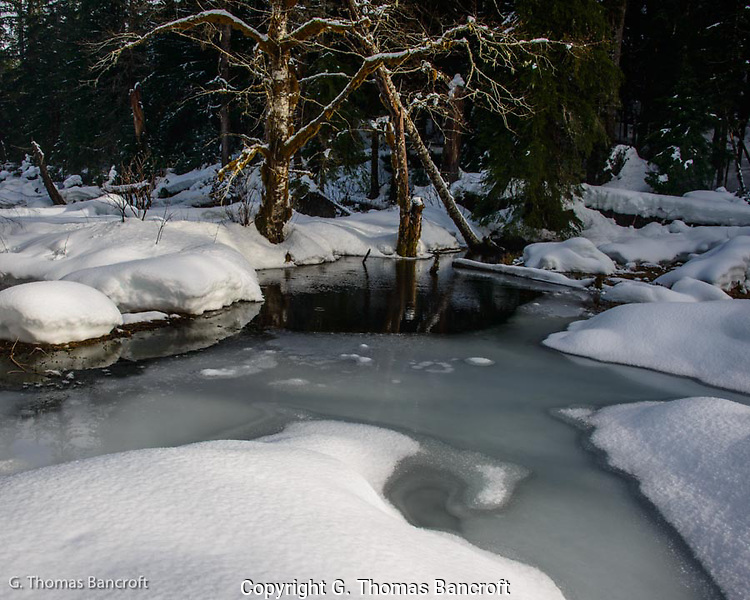 Along the trail, the snow covered trees produced a very serene feeling while if you looked across the lake at the storm clouds approaching it was more tempestuous. Some blue squeaked through the clouds in a few places and occasionally the sun became brighter when the clouds temporarily thinned. The Snoqualmie Nordic Club had a hot chocolate stand on the way back to the car which was a perfect break and energy burst for the last quarter mile. Out and back took almost 4 hours and was a wonderful way to spend the morning. As I drove down from Snoqualmie Pass, the snow turned to rain and it rained all the way back into Seattle. 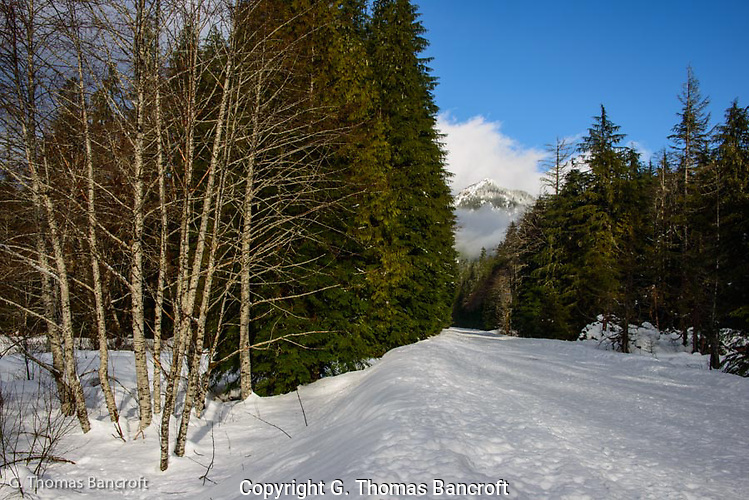 In winter, the Forest Service closes a gate across Mountain Loop Road about 25 miles east of Granite Falls, Washington. I arrived at the gate at dawn to walk up the valley. Rain showers were happening at regular intervals and the light was soft and even with the cloud cover. 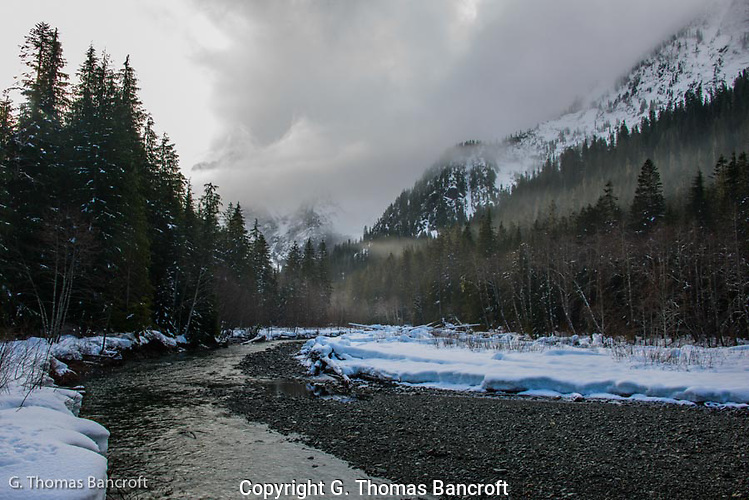 The walk parallels the Stillaguamish River and has great views of the river and surrounding mountains although the low clouds blocked seeing the mountains this morning. It was just above freezing but there was still snow on some of the spruce branches and trunks. 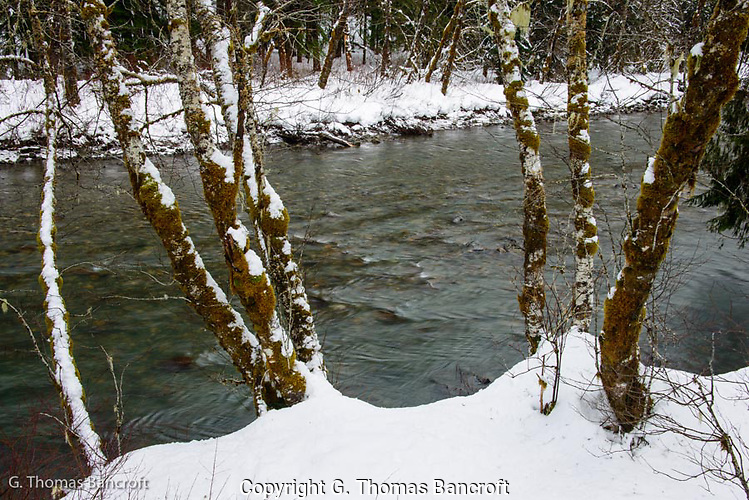 The alder trunks with a combination of snow, moss, and bark were quite attractive especially where the river back dropped the trunks. The snow on the road was well packed down but I was the only person there until noon when I was headed back to my car and two groups of cross-country skiers passed me headed up the road. The solitude was wonderful. There was no wind so the valley was quiet except for a few birds. A flock of siskins flitted around the tops of few spruce for a few minutes and a raven flew down the valley squawking at one point. I heard a steller’s jay fly into a bush along the north side of the trail. The bird dropped down to the ice and hopped along the edge of the ice dipping its bill into the water at several places to take a drink. It then flew up on the snow bank and poked around for a few seconds before flying off. An interesting set of animal tracks came across the snow and looked as if the animal was moving pretty quickly. 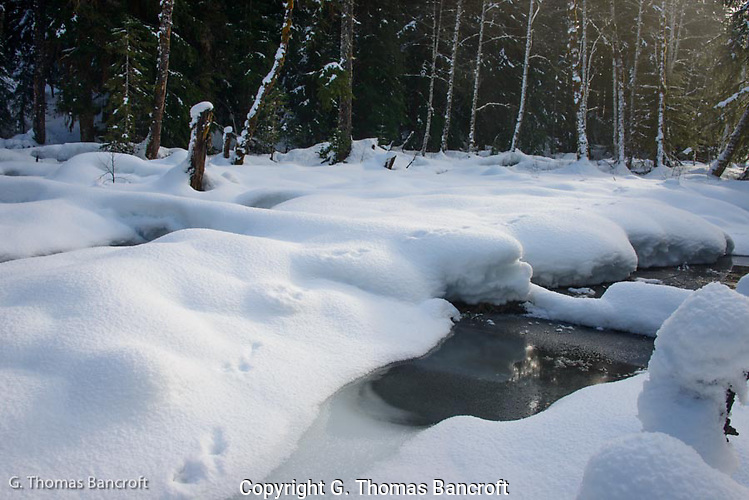 The three or four prints were close together in the snow and each set was three or four feet apart. I saw elk prints elsewhere but these looked too small for elk. Mid morning the storm began to clear and blue sky was visible through the trees. The mountain peaks looked like they were covered with a fresh layer of snow. Fog moved into the valley and waves of fog passed by me as I walked along the trail. Several times, it was quite tranquil as the landscape had a combination of fog, blue sky, and sunlight highlighting the vegetation. I stood for a while along the bank of the river and enjoyed the serene view. I spent four hours enjoying the great valley. It is definitely a place worth another visit. This was the first morning in four days that we did not have thick fog in Seattle. I headed up to Green Lake to see what was happening. 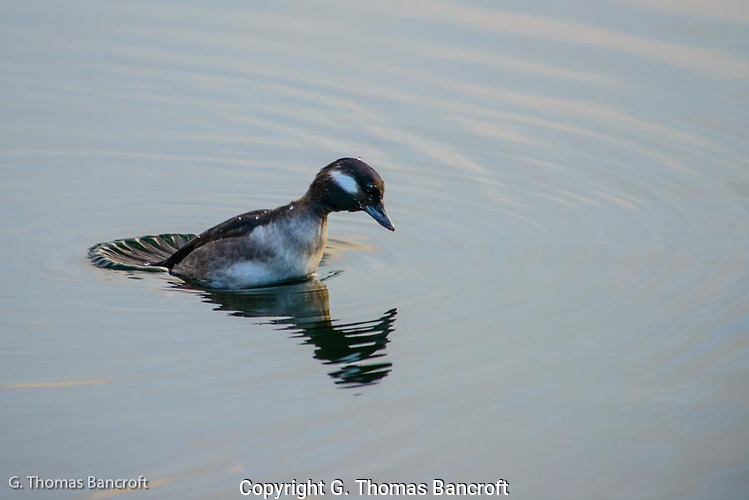 A Bufflehead male was actively feeding adjacent to a wonderful reflection of trees. The reflection of the bird and the trees was an interesting contrast. Along the west side of the lake is a fringe of cattails. The seed stalks from last year are still standing and the seeds are beginning to flack off the stocks. It is an interesting design against the water background. I did not see any new growth starting but I am guessing it will be soon. The Red-winged Blackbirds at least think spring is just around the corner. I heard several males in the tops of trees giving partial territorial songs. The males were together in the trees so they have not become territorial yet. In a few weeks they will be defending sections of the cattails and trying to attract females. 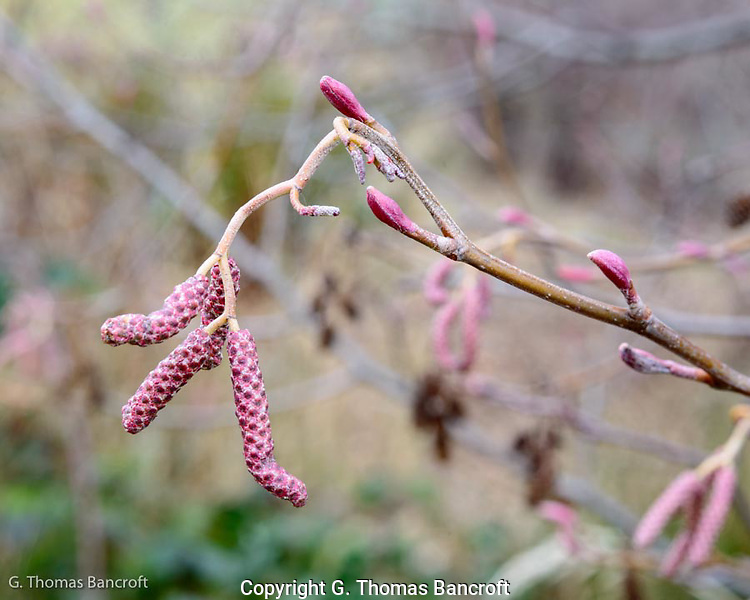 The red alders still have seed cones present from last year and the new catkins are beginning to develop. Fresh leaf buds are beginning to swell along some of the branches. Other branches had not shown any signs of new leaves. I will check to see when the leaves start to open. A good sign that spring might be coming. My fingers quickly became numb in the below freezing air as I surveyed the flock of birds around the pylons at the Mukilteo ferry dock. The pylons and rocks at Mukilteo ferry dock must have a rich growth of mussels for a large flock of Surf Scoters and Barrow’s Goldeneyes seem to winter there each year. The flock ebbs and flows from around the pylons to open water in response to the comings and goings of the ferry and passengers. Individuals were constantly diving by the base of posts and swimming under piers in search of food. Several times I saw individuals surface with a large mussel clump in its mouth to be instantly attacked by a young Glaucous-winged Gull. It looked like two or three gulls had a strategy to wait and see if they could steal food from unwary scoters. The scoters quickly dove to eat their morsel under water and not loose it to the gulls. 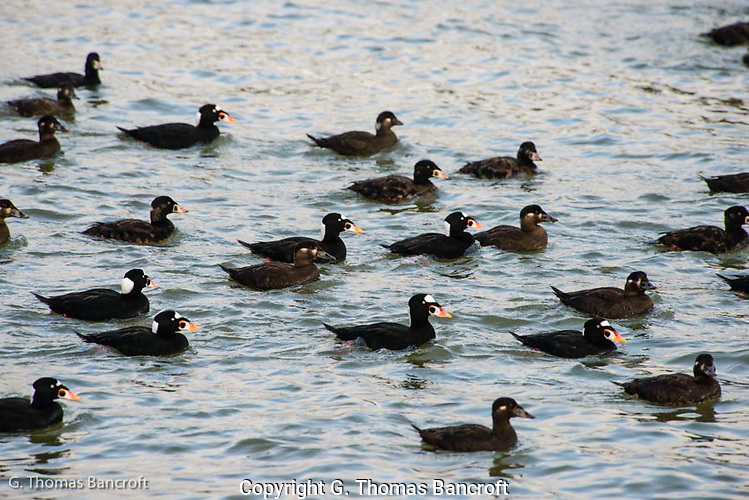 The area had the constant chatter of scoters. 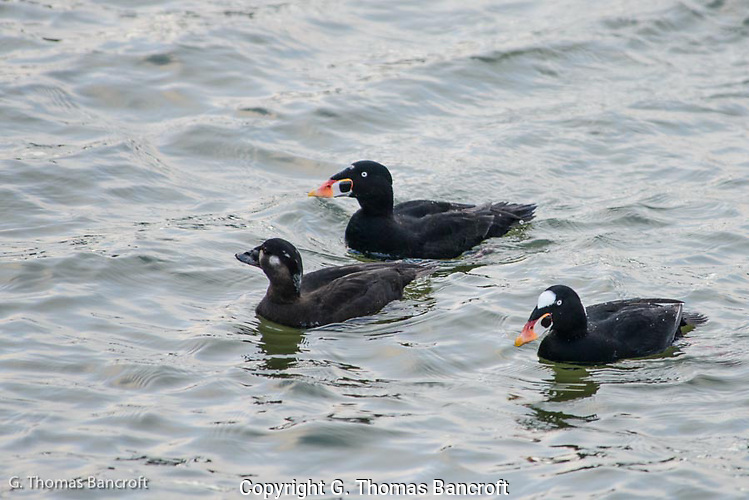 The adult male surf scoter is a gaudy looking beast. Its bill is orange with a black dot near the base that is surrounded by a white patch. It has a white patch on the forehead, a large white blob on the back of the head, and all the rest is black. They stand out in the flock. Adult females are mainly dark with a little white at the base of the bill, on the checks, and a small amount of white on the back of the head. Young birds are in between in color. The adult male Barrow’s Goldeneyes are quite striking, with a crescent white patch at the base of the bill and white along its side. The adult females have a wonderful dark brown head with a mostly yellow bill. The pairs are quite striking and remind me of seeing beautiful couples walking down a street. Surf Scoters breed in Canada and Alaska while some Barrow’s Goldeneyes nest in continental United States, most nest farther north. The wintering population of sea ducks in Puget Sound has decreased substantially over the last 40 years. Some information suggests that populations may have decreased by as much as 70% in the last 40 years. It is not known why numbers have decreased so much. One thought has been that there has been a decrease in food supply. In Puget Sound, Washington has joined into a national study of mussels to assess what is happening in the environment and whether toxic chemicals are affecting mussel populations. Snohomish County has been very active in this effort and the hope is to expand the study across Puget Sound in a broader effort. After a while, it seemed like my fingers were frozen so I headed back to my car to catch the ferry across to Whidbey Island. 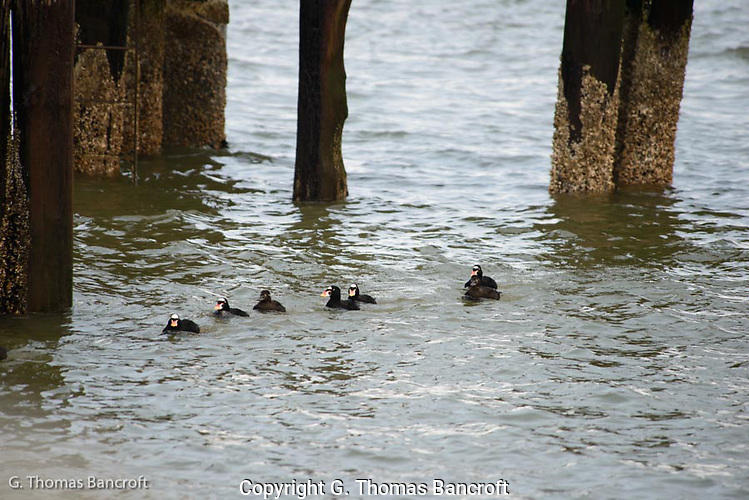 If you want to see surf scoters and Barrow’s goldeneyes, the Mukilteo Ferry dock is a place to look during the winter months. It is definitely a sight worth seeing. They are spectacular birds in Puget Sound. The sun had just risen above the horizon at Green Lake and was peaking through some slits in the otherwise solid cloud cover. The light reflected off the rippling surface of the lake and the clouds created a dramatic reflection. The air was crisp, with the temperature just above freezing. 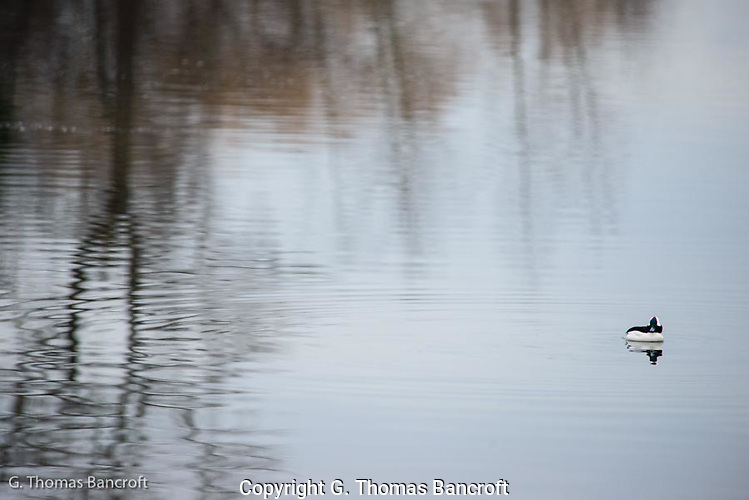 The ducks and coots were still actively feeding along the shallows. 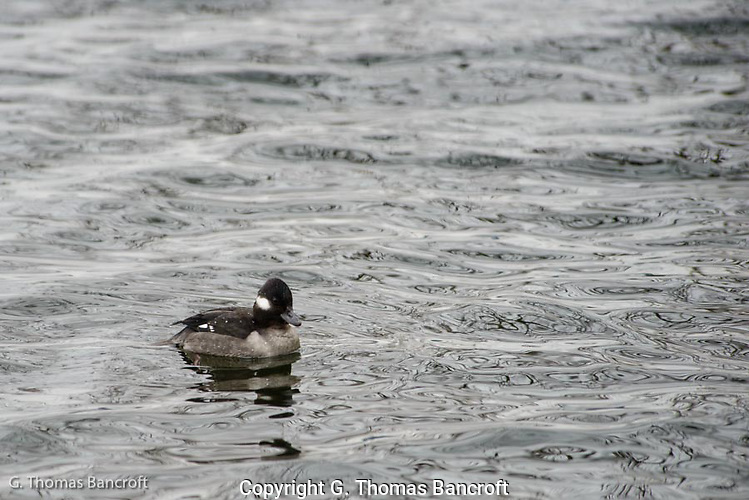 A female bufflehead dove repeatedly along the shore. She would surface for a few seconds and then pushing hard down with her tail, she would leap up into the air with great energy to start her dive. Her tail feathers spread to create a good rudder as she pursues underwater prey. 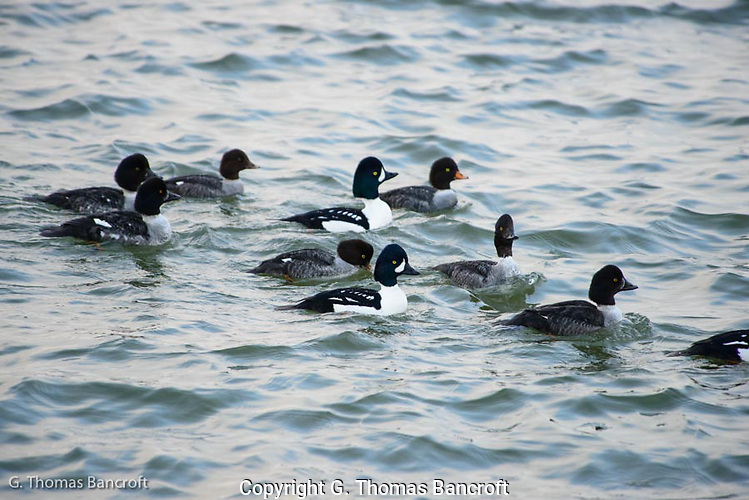 Buffleheads are the smallest of North America’s diving ducks and generally feed in water less than 10 feet deep. Several pied-billed grebes were also actively feeding. They stayed on the surface for only a few seconds between dives and would often pop back up 50 or more feet from where they dove. These birds are pursuing small fish. By an hour after sunrise, some ducks were coming to roost along the shore having found sufficient food for a while. 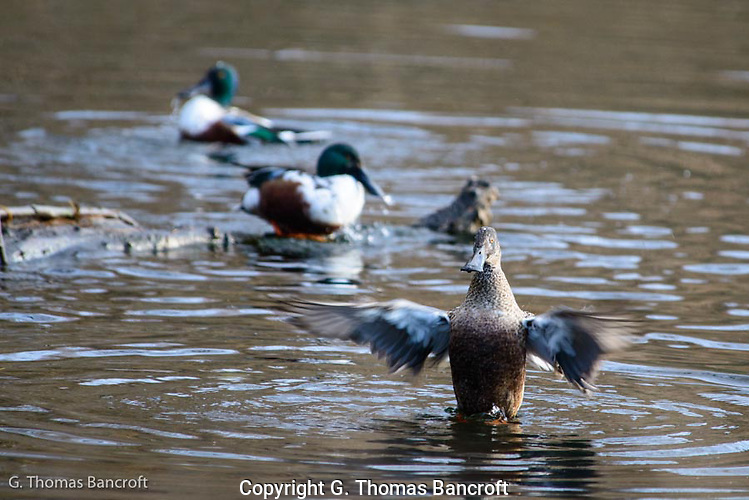 I watched three shovelers preening and taking a quick bath. They would fluff their feathers and throw water across their backs by dipping their heads into the water. One sat on a log, working to preen individual feathers, straightening out shafts and recoating feathers with oil to keep them waterproof. It is amazing that something as delicate as a feather can create a waterproof coating for a bird allowing them to swim and be dry and warm. Even a small amount of water on the skin can quickly cause a bird to become hypothermic and die that is why oil spills are so dangerous for birds. 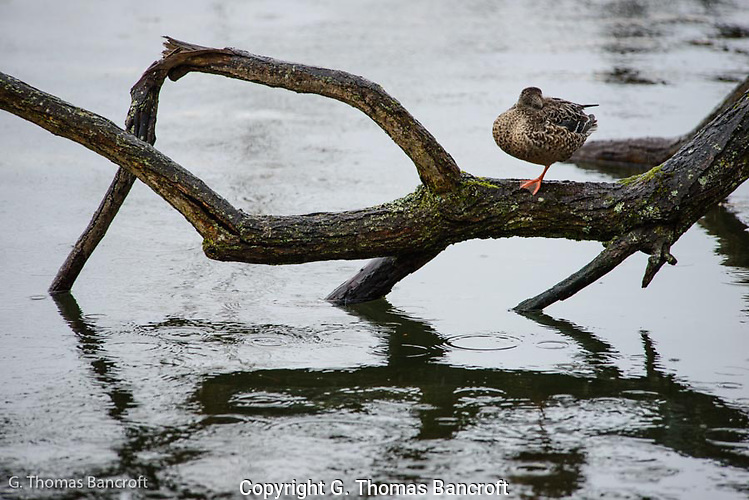 A female shoveler having finished both feeding and preening had found a good resting place on a branch over the water. She had her bill tucked under her scapular feathers and seemed to be resting contently. Once when a dog barked briefly she pulled her head out for a quick look around. Deciding that nothing was serious, she stuck her bill back under her feathers and seemed to go back to sleep. 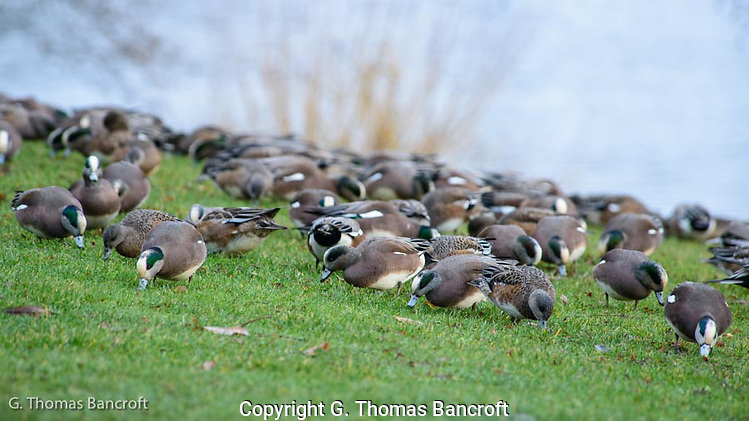 The high pitch whistle of the American widgeon caught my attention and I looked around to see where it came from. I discovered more than a hundred widgeons foraging on the lawn as if the mass was a giant mowing machine. They flowed left and right along the grass as one bird or another changed direction. Occasionally, an individual would fly into the center of the flock and disrupt everyone’s concentration on foraging. A runner caused them to shift direction back toward the water with a few individuals leap frogging over the mass. I wonder how much grass they consume in the morning. Just before the parking lot, I heard the chip of two Bewick’s wrens and discovered them foraging at the base of a pine tree. 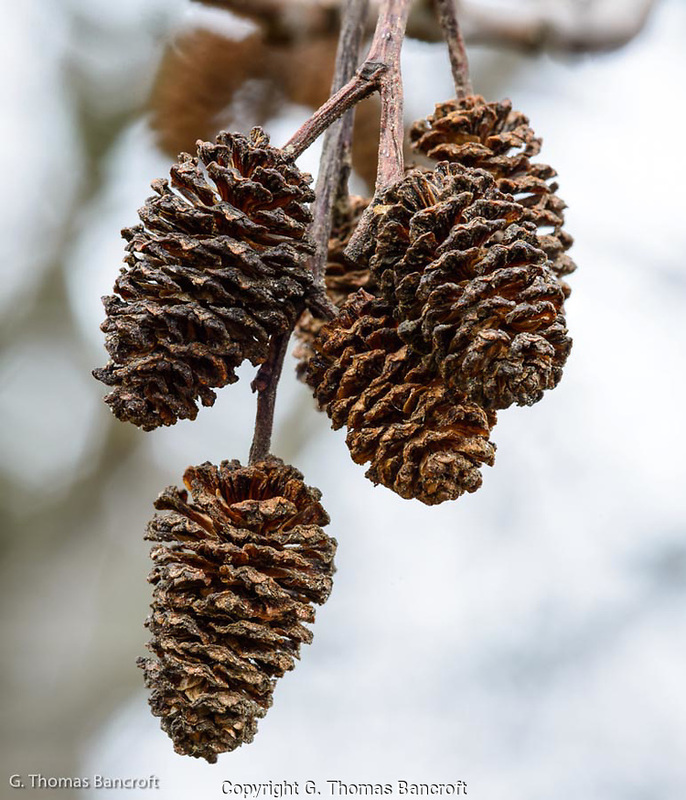 They were hoping up along the bark of the tree picking at things in the bark and flipping needles around the base of the three. A flock of 30 robins were scattered under the pines looking for worms and grubs. Staying in numbers was providing more eyes to warn the group of approaching predators. The robins were actively running along the ground, stopping, and cocking their heads as they looked for food. As I climbed back into my car, a few large snowflakes were falling with the light rain; a wonderful morning to be out.